The palm trees nod politely to each other along the riverbank. Black and white kingfishers dart in and out of the shallows, playing a game of hide and seek among the reeds that line the waters edge. The great river Nile surges underneath the boat, making its journey from Ethiopia to spill into the Mediterranean, thousands of miles away. This is Egypt. 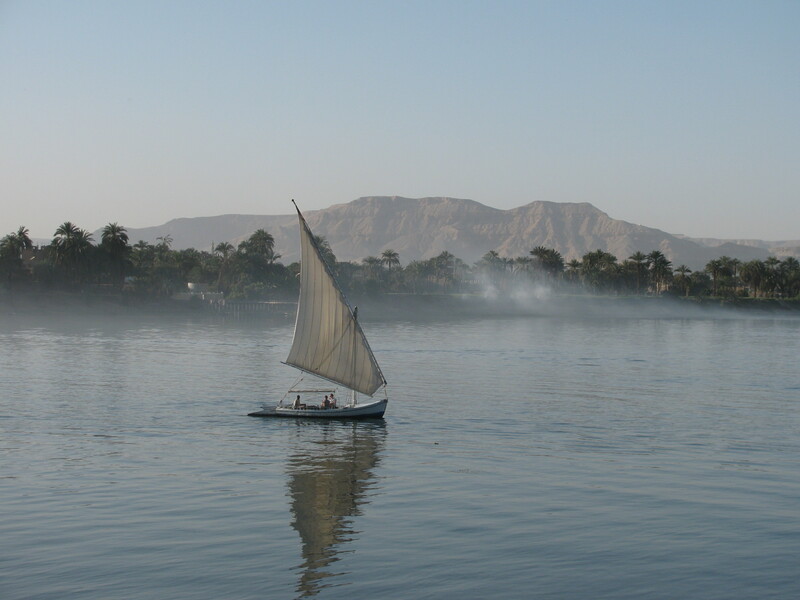 To cruise the Nile is to sail through a timeless landscape. Ok, so the electricity pylons compete with the ancient stone-built pylons (or gateways) of the ancient temples. We’re not so much sailing under the gigantic sails of a Victorian dahabeeyah as being propelled through the water by diesel, no doubt leaving choking fumes in our wake. But this is still Egypt. Exotic, timeless, romantic and just slightly scary. The sun beats from a hard, hot sky, demanding submission in much the same way I imagine the ancient Pharaohs once did. The locals hassle incessantly, citing the delights of caleche rides (horse and carriage) and trips out on a felucca at sunset. Baksheesh is a way of life. The price they suggest is never actually what they mean, or what you’ll end up paying if you’re unwary. But the people are friendly, welcoming and eager to share the delights of their country and way of life. I don’t think there’s anywhere quite like it on the planet. Ancient and modern juxtaposed in a way that makes you wonder which is more deserving of its position. This is the setting for my series of books following Meredith Pink’s adventures in Egypt. Through her, I get to spend all my leisure time in the fabled land of the Pharaohs. There’s nowhere I’d rather be, whether it’s for real or the opportunity to travel along the banks of the Nile in my imagination. Here’s a short video I made showing typical river scenes from the deck of a Nile cruiser. I hope it brings a little slice of Egypt to wherever you are right now. Posted on April 4, 2013 by Fiona Deal. This entry was posted in ancient Egypt, Egypt and tagged egypt, Luxor, Meredith Pink, Nile, nile cruise. Bookmark the permalink.